Lipid Peroxidation (MDA) Assay Kit (Colorimetric/Fluorometric) (ab118970) provides a convenient tool for sensitive detection of malondialdehyde (MDA). MDA, together with 4-hydroxynonenal (4-HNE), is a natural bi-product of lipid peroxidation and its quantification is generally used as a marker for lipid peroxidation. In the lipid peroxidation assay protocol, the MDA in the sample reacts with thiobarbituric acid (TBA) to generate a MDA-TBA adduct. The MDA-TBA adduct can be easily quantified colorimetrically (OD = 532 nm) or fluorometrically (Ex/Em = 532/553 nm). This assay detects MDA levels as low as 1 nmol/well colorimetrically and 0.1 nmol/well fluorometrically. The MDA assay is also refered to as a TBARS assay. For higher sensitivity, precipitate with n-butanol, centrifuge, dry and resuspend pellet before analysis. For an alternative MDA assay, without the heating steps required in the TBARS assay, try MDA assay ab233471. Lipid peroxidation refers to the oxidative degradation of lipids. In this process free radicals take electrons from the lipids (generally in cell membranes), resulting in cell damage. Quantification of lipid peroxidation is essential to assess oxidative stress. Lipid peroxidation forms reactive aldehydes such as malondialdehyde (MDA) and 4-hydroxynonenal (4- HNE) as natural bi-products. Measuring the end products of lipid peroxidation is one of the most widely accepted assays for oxidative damage. Review the oxidative stress marker and assay guide, or the full metabolism assay guide to learn about more assays for metabolites, metabolic enzymes, mitochondrial function, and oxidative stress, and also how to assay metabolic function in live cells using your plate reader. Lipid peroxidation refers to the oxidative degradation of lipids and is a well-defined mechanism of cellular damage. The formation of lipid peroxidation products leads to spread of free radical reactions leading to cell damage. 10 mg of tissue were homogenized on ice in 300 μL of MDA lysis buffer, then centrifuged (13,000 × g, 10 min) to remove insoluble materials. 10 μL of plasma were mixed with 500 μL of 42 mM H2SO4 and 125 μL of phosphotungstic acid solution at room temperature for 5 min. After centrifuging (13,000 × g, 3 min), the pellet was re-suspended on ice with 100 μL of double-distilled H2O. Then, 200 μL of solution and 600 μL of 2-thiobarbituric acid solution were incubated at 95°C for 60 min, before cooling to room temperature in the ice bath for 10 min. The intensity of absorbance at 532 nm was proportional to the MDA level. Typical MDA standard calibration curve using colorimetric reading. Typical MDA standard calibration curve using fluorometric reading. 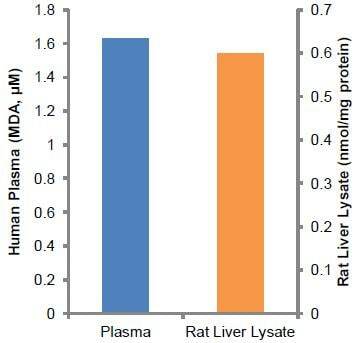 Measurement of MDA in human plasma (20 µl) and rat liver lysate (10 mg). Is this kit compatible with protein samples extracted using RIPA buffer (so with SDS, triton) or do I need to use a different extraction buffer? The MDA kit should be compatible with RIPA but the concentration of SDS needs to be less than 5mM. 1. Can I mix more than 10ul plasma with 500ul sulfuric acid? I am trying to boost signal by adding more concentrated sample. 2. It seems the standard curve produced by the kit is a good one but I see no signal from plasma samples. I have followed the protocol exactly. Do you have any ideas why one would not see any signal with plasma? 3. After heating and cooling the samples, do I need to run the assay immediately or can the cooled samples be stored? If storage is possible, what do you recommend? A1: We have found that the 10 ul plasma worked well. How much more plasma is used depends on the protein content. A2: If there is low amounts of MDA adduct formed in plasma samples, then the fluorometric method might provide 10 fold increased sensitivity to detect this. It is possible in that case to not register any OD or see background OD with samples. A3: For best results we do not recommend storing samples after 95C heating and cooling. Lipid binding to the walls of the tube can happen upon storage and this can skew the data. The TBA is not going into solution in the glacial acetic acid. Sonication in a RT water bath can be used if needed. You can also dissolve TBA in 15 ml of 50% glacial acetic acid in water. Then fill the volume with water to make 25ml. Mix well. This should help in dissolving the TBA. If there is still little precipitate, use 600 ul as directed and any particle in suspension will dissolve at 95C when incubated for 60 mins. How are the nmol standard curve units converted to units of uM concentrations and micrograms? Here is my conversion from nanomoles to micromolar concentrations and micrograms of MDA for the units that are used for the X-axis of the data on the datasheet. Please let me know if this does not answer you question or if you have concerns about the values you obtained. The standard you receive in the kit is 4.17M. Dilute 10ul to 0.1M, then 2mM. Standards for the colorimetric assay are 0, 2, 4, 6, 8, 10 ul of the 2mM solution, per tube. The amounts per tube are specified in the protocol and the data as nanomoles (nmol), not nanomolar concentrations (nM). For example, the 2mM standard solution contains: 2 millimoles per liter, = 2 nanomoles per microliter. The standard that contains 2 ul contains 4 nanomoles. The molar concentration of this standard, after bringing the volume to 200ul (which is also the volume of the experimental samples), is 4 nanomoles per 200ul, = 20,000 nanomoles per liter (4 x 5000 nanomoles per 200 x 5000 ul) = 20 micromoles (umol) per liter, which is a 20 micromolar (uM) solution. So, you are comparing your samples to MDA standards that are concentrations of 20, 40, 60, 80, and 100 uM . The molecular weight of MDA is 72g/L. (One mole weighs 72g). A 20 uM solution contains 1440 ug per liter. (72/1,000,000 x 20). In 200 ul, you will have: 1440/5,000 ug, = 0.288 ug. So, the standard tubes contain: 0.288, 0.432, 0.576, 0.72, and 1.44 ug per tube. can you tell me where in the protocol I can stop the assay and how the samples should be stored at that point? We do not recommend that the protocol be stopped for later continuation at any step for this assay. If you cannot perform the whole protocol on the same day, I would recommend storing the samples initially at -80°C for later processing according to the protocol. Appropriate sample types include Cell culture supernatant, Plasma, Other biological fluids andTissue Extracts. I would like to know I can use this kit for checking MDA in serum samples of human. I am sorry to confirm this kit has not been tested on serum samples yet. Since it has not been used for analysis of serum, I am sorry we unfortunately do not have any procedure or tips for such use. I can recommend that as plasma samples are similar, to try the procedure provided for plasma to start with and optimize from there. We don't have 532 nm of colorimetric spectro filter in my lab, we only have the 520nm. And so, is it ok if I use 520nm? would it effect the accuracy of the measurement significantly? I can confirm you would be able to use the 520 nm wavelength for detection, provided the instrument's bandwidth of detection range is +/- 12. If not, measuring at 520 nm will reduce the efficiency of detection at least slightly. Would heparin treated plasma samples be compatible with this kit? Yes, heparin should be fine to use. The standards work well but I see precipitation in my sample after heating at 95 degrees C for 60 min. Samples are cell extracts. 2. How should this be addressed? Centrifuge the samples and take only the clear supernatant for the next step. At the end of the protocol there is a note about the use of n-butanol for more sensitivity. I must add the n-butanol to the 800 µl reaction mixture. Do I have to add the n-butanol also to the standard or only the samples? I can confirm that you will need to use the n-butanol for the standards as well, since it helps in isolating the MDA-TBA adduct.